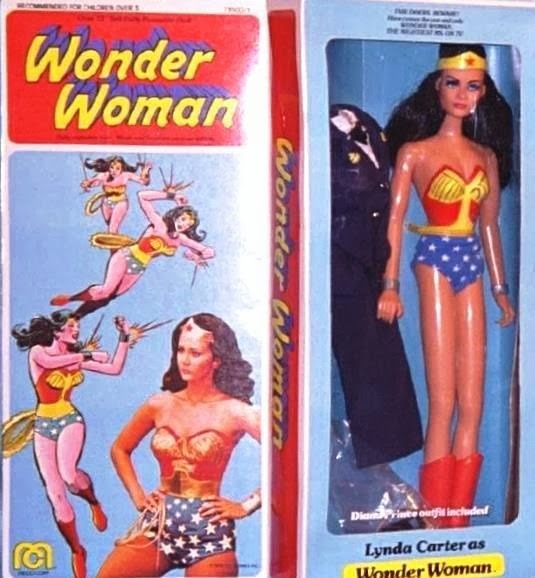 Lynda Carter's Wonder Woman (1975 - 1979) captured the imagination of a generation of kids during the era of The Six Million Dollar Man (1974 - 1978) and The Bionic Woman (1976 - 1978). 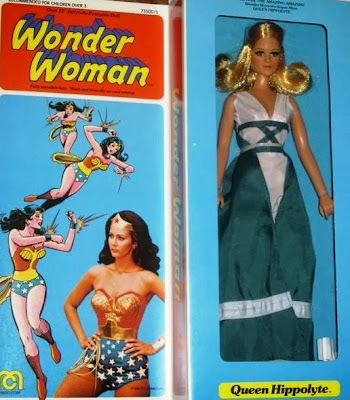 While Kenner had licensed those particular superhero programs, Mego released several large-scale, 12-inch action figures from Wonder Woman. The first and most important such figure was Wonder Woman herself. This Amazonian came equipped with a magic lasso, tiara, and bullet-proof bracelets. 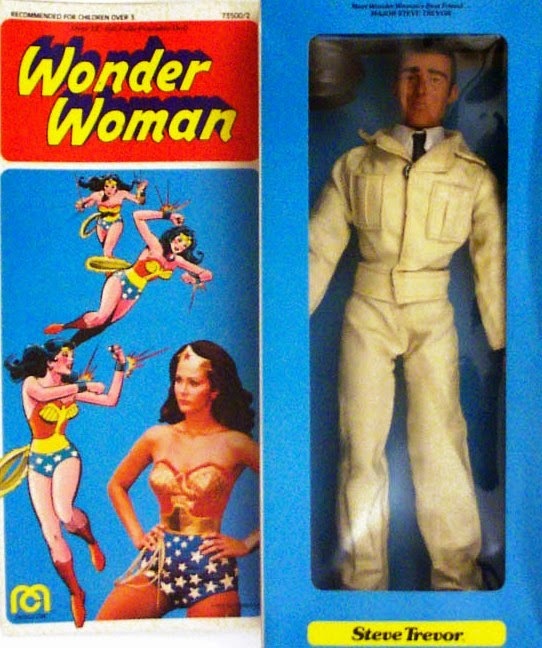 In Canada, additional costumes were released for Diana Prince, though not in the United States. The toy figure had a re-release in 1978 with "new fly-away action!," though today I can't recall what that descriptor actually means. Steve Trevor -- a character played by Lyle Waggoner on television -- was also released in action figure format as well, so that Wonder Woman had someone to rescue. 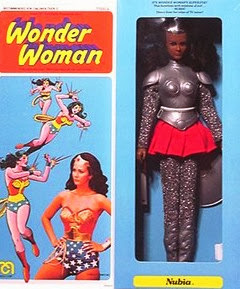 The final two figures in the line were Queen Hippolyte (Cloris Leachman on TV), the queen of Paradise Island, and more interestingly, fellow Amazonian Nubia, a character described as a "super foe" for Wonder Woman. Nubia was black, gorgeous, and wore silver body armor. 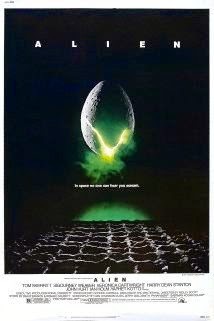 The character never appeared on the TV program, though plans had been afoot for her to do so before the series switched networks for its third and final season. The extremely rare Nubia came equipped with a shield, and a sword, and is one of those toys which I really wish I had bought, back when I was a kid. She looks....bad.